The Best Analytics blogs from thousands of top Analytics blogs in our index using search and social metrics. Data will be refreshed once a week. Analytics newsletter is a comprehensive summary of the day's most important blog posts and news articles from the best Analytics websites on the web, and delivered to your email inbox each morning. To subscribe, simply provide us with your email address. About Blog This is a passionate community to learn every aspect of Analytics from web analytics to big data, advanced predictive modelling techniques and application of analytics in business. Facebook fans 45,604. Twitter followers 15,846. San Francisco, CA About Blog A reddit dedicated to web analytics and the latest data reports. Facebook fans 1,072,195. Twitter followers 460,770. About Blog The analytics section of the Crazy Egg blog covers the intersection between analytics and conversion optimization, with a look at the related areas of copywriting and web design. Facebook fans 10,190. Twitter followers 52,149. US, UK, India, Singapore, UAE About Blog We believe analytics is changing the world in many ways. Big Data is growing immensely and companies that harness that data have tremendous opportunities to better connect and engage with consumers to enhance loyalty. Facebook fans 9,316. Twitter followers 2,383. Facebook fans 1,457. Twitter followers 4,479. Denver, CO US About Blog A quantitative research firm, MeasuringU focuses on “the statistical analysis of human behavior and quantifying the user experience.” The MeasuringU blog specifically centers on usability, customer experience, and statistics, making it a valuable customer analytics blog. Facebook fans n/a. Twitter followers 23,152. Bordeaux, France About Blog Discover the DA BLOG, dedicated to Digital Analytics and Digital Intelligence: best practices, tips and advices to optimize your digital performance. Facebook fans 3,546. Twitter followers 4,088. Washington, DC About Blog Logi Analytics embeds business intelligence in the fabric of your organization and products. With Logi, you can seamlessly embed custom analytics in your apps—empowering your customers and employees with smarter insights. Facebook fans 809. Twitter followers 5,129. Copenhagen, Denmark About Blog Canecto´s Automatic Web Analytics Reports tell you exactly what to change on your site to get more online business. Seattle Area About Blog Kevin Hillstrom, president of MineThatData, explains how customers behave and helps CEOs understand the complex relationship between customers, advertising, products, brands, and channels. Hillstrom’s MineThatData blog addresses the same customer analytics topics and shares his insights and experience with readers. Facebook fans n/a. Twitter followers 6,387. About Blog A digital analytics blog focusing on Google Analytics & Google Tag Manager in-depth guides, Strategies & Case Studies. Facebook fans 588. Twitter followers 1,374. Facebook fans 2,430. Twitter followers 684. Illinois, USA About Blog Russell Walker is an author, professor, and keynote speaker on Big Data, analytics, risk, and international business. His data analytics blog, Big Data to Big Profits, focuses on how firms that create data are creating economic value from Big Data. Dr. Walker’s posts are thorough and insightful and cover all aspects of Big Data, data analytics, and customer analytics. Facebook fans n/a. Twitter followers 2,685. About Blog Talking web analytics with a focus on the Google Analytics platform. Pittsburgh, PA About Blog LunaMetrics offers Google Analytics and Search consulting services to a breadth of companies & organizations. On their blog, see why experts around the globe turn to LunaMetrics for the latest information and advice on Google Analytics, AdWords and SEO. Facebook fans 3,266. Twitter followers 8,760. Facebook fans 984. Twitter followers 3,019. Nashville, TN About Blog Juicebox is a tool for visualizing data. It helps users gather more insights from their data. Their Blog also delivers more insights to readers, by providing posts about using data, visualizing data, and gaining a better understanding of customers through data analysis. Facebook fans 131. Twitter followers 3,005. The Wharton School - Phila, PA About Blog The University of Pennsylvania’s Wharton Customer Analytics Initiative (WCAI) is a top academic research center focusing on the development and application of customer analytic methods. The WCAI blog shares the latest news and information in customer analytics and features news from in and around the WCAI itself. Facebook fans n/a. Twitter followers 6,710. Kolkata, India About Blog Fusion Analytics World is the Leading Digital Platform for News, Industry Analysis, Jobs, Courses, Events & much more. Covering Research & Analytics across Industries. Facebook fans 2,118. Twitter followers 148. About Blog Nikhil is nothing short of “Swiss Knife of Digital Marketing” over the course of last 10 years he has been involved in practically every facet of Digital Marketing and Analytics. Starting career with paid search Nikhil has built and managed award winning digital campaigns, has been Google Adwords Top Contributor, Planned and implemented several complex and large scale web and mobile analytics implementations. United Kingdom About Blog Blog featuring current analytics news, tool reviews and video guides, and Digital Marketing insights. Facebook fans 1,913. Twitter followers 14,967. Sydney, Australia About Blog At Datalicious we are all about smart data driven marketing and turning data into actionable insights. Facebook fans 2,270. Twitter followers 13,037. Singapore & Mumbai About Blog The Aureus blog highlights interesting information about the multiple areas of big data and analytics in the form of infographics and text blogs. Facebook fans 719. Twitter followers 1,132. NYC • Wroc?aw • Köln About Blog Read our latest posts about the Data Privacy, Advanced Web Analytics and news about the Piwik PRO On-Premises. Facebook fans 504. Twitter followers 894. About Blog We are a team of data scientists and information designers who help you decide, engage, and convince with data. Menlo Park, CA About Blog Welcome to Interana - Behavioral Analytics solutions that enables people to obtain insights from the actions people, products, or machines make over time. Their blog offers the latest industry news, articles and opinions. Facebook fans 243. Twitter followers 7,439. Bengaluru, India About Blog Elogic Square adapts the capabilities of the Big Data and Analytics, Social Media, Cloud Computing, Artificial Intelligence (AI), Robotics, Mobility and Pervasive Computing to the unique needs and opportunities of each industry. Facebook fans 24. Twitter followers 52. 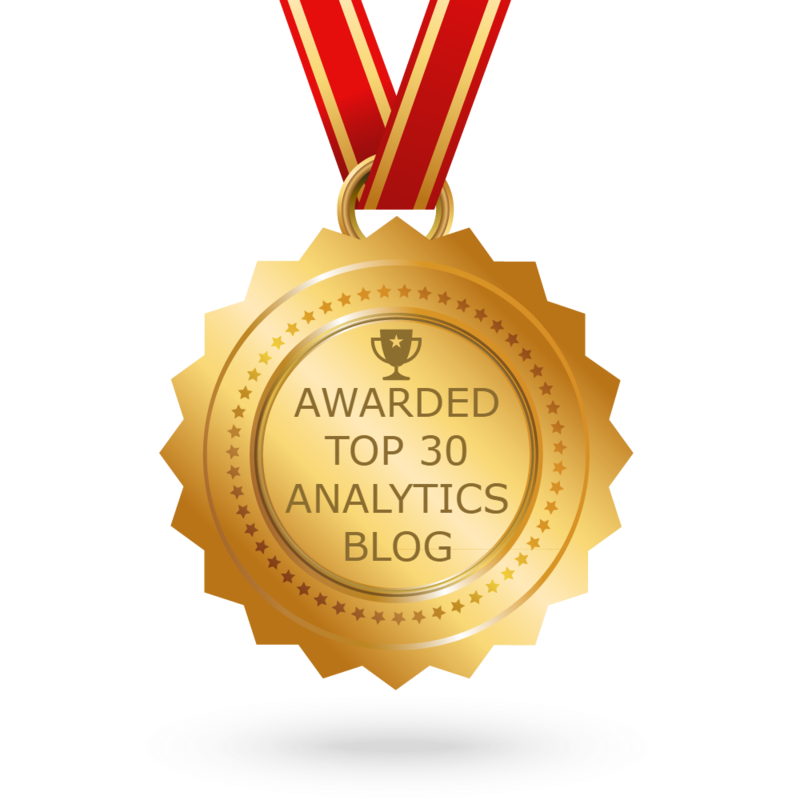 CONGRATULATIONS to every blogger that has made this Top Analytics Blogs list! This is the most comprehensive list of best Analytics blogs on the internet and I’m honoured to have you as part of this! I personally give you a high-five and want to thank you for your contribution to this world.